1. Sanshiro Takagi & Tomomitsu Matsunaga defeated Mad Paulie & Nobuhiro Shimatani when Matsunaga pinned Shimatani with a Cradle (6:22). 2. Toru Owashi, Kazuki Hirata & Yuki Ueno defeated MAO, Keisuke Ishii & Makoto Oishi when Hirata pinned Oishi with the Miracle One Shot Cradle (9:08). 3. Do Not Stop The DDT Video Group Camera! 2 Vs 1 Handicap Match: Yumehito Imanari defeated Super Sasadango Machine & Norikazu Fujioka when Imanari pinned Machine with the Chubby Knee (7:53). 4. KUDO & Masahiro Takanashi defeated Kazusada Higuchi & Antonio Honda when KUDO pinned Honda with the Diving Double Knee Drop (10:04). 5. The Strongest Oyaji Decision Match: Yukio Sakaguchi defeated Tanomusaku Toba by Knockout with a Right High Kick (6:18). 6. Daisuke Sasaki, Tetsuya Endo & Soma Takao defeated Konosuke Takeshita, Akito & Yuki Iino when Endo pinned Iino with the Swivel Torture Rack Bomb (16:20). 7. Nagoya Specialty! 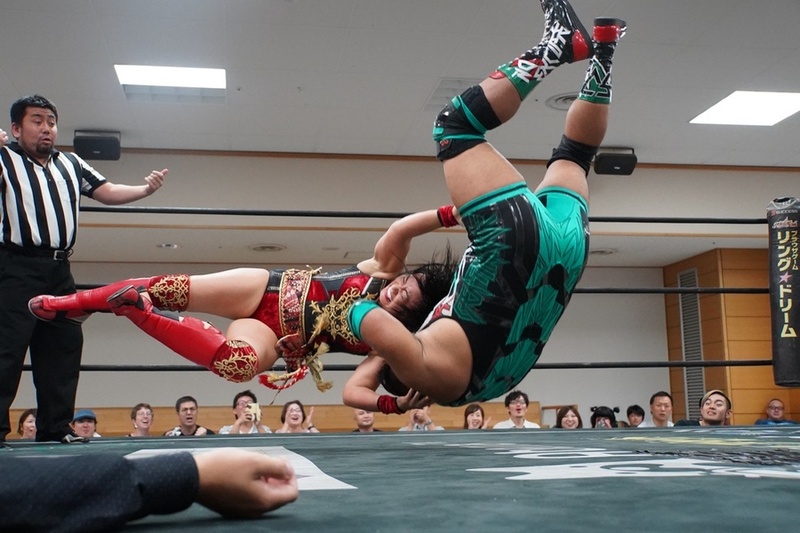 Miso Stew Special Tag Match: Meiko Satomura & HARASHIMA defeated Shigehiro Irie & Mizuki Watase when HARASHIMA pinned Watase with the Somato (12:09). Meiko Satomura gave Shigehiro Irie the Death Valley Bomb then held him back while HARASHIMA pinned Mizuki Watase with the Somato. Satomura told the crowd afterward that she wants to appeal her way of life in DDT because she has pride in what she has accomplished in joshi. A missed Spear ruined ALL OUT’s chances of beating DAMNATION in their latest showdown. Yuki Iino targeted Tetsuya Endo but a well timed dodge led Iino Spearing into Konosuke Takeshita instead. Endo capitalised with the Handspring Leg Lariat and Swivel Torture Rack Bomb to win. Yukio Sakaguchi and Tanomusaku Toba both focused on trying to get either a knockout win or a submission over the other. A clash between Sakaguchi’s High Kick and Toba’s Right Hook ended in Sakaguchi’s favour and Yukinori Matsui stopped the match when Toba hit the canvas with no sign of recovery. After the match Sakaguchi reminisced about the old days and thanked Toba for bringing him back to his entry to DDT 6 years ago. He asked for another match sometime but Toba pleaded with him not to do it. Shuten-dōji then invited Toba to join them for a toast but they did not have a drink for him, so Toba grabbed tea from a spectator. Before the DDT Video Group 3 Way Match began, Yumehito Imanari revealed that he is quitting his role in the team and part of it is Super Sasadango Machine’s fault! Norikazu Fujioka pleaded with him to change his mind otherwise the entire team would collapse without him. Imanari then proposed to change the match into a 2 Vs 1 Handicap Match. If Imanari loses to Sasadango & Fujioka then he will not quit the Video Team. Fujioka tried to stand up and act tough but Sasadango reminded him he doesn’t have the body or the training to wrestle. Fujioka proved Sasadango wrong by doing a Hurricanrana. Unfortunately he did it to Sasadango instead of Imanari. That led to Imanari hitting Sasadango with the Chubby Knee to win the match. Sasadango accepted defeat and said he and Fujioka will do their best to run DDT’s video production without Imanari. However Imanari had a change in heart and decided he will keep working with them when he can while he wrestles for Ganbare☆Wrestling. Kazuki Hirata survived the Miracle Ecstasy from Makoto Oishi. He then countered the Jikiden Tornado Clutch into the Miracle One Shot Cradle to get DISASTER BOX the win. This was good progress for the Hirata, Toru Owashi & Yuki Ueno as they prepare for their KO-D 6-Man Tag Team Titles match next month. A big entertainment news story in Japan currently is the retirement of singer Namie Amuro. The DDT wrestler most effected by this news is Nobuhiro Shimatani. He wanted to sing her songs because her music changed his entire life. Sanshiro Takagi & Tomomitsu Matsunaga did what they could to stop him. Booing 2018 won the match and to add insult to injury, sang and danced along to one of Namie Amuro’s songs afterwards. Takagi didn’t know the lyrics so he just hummed along to the music. This entry was posted on Monday, September 17th, 2018 at 7:58 pm and is filed under Results. You can follow any responses to this entry through the RSS 2.0 feed. Both comments and pings are currently closed.